Have you noticed that Spring zucchini has been on sale lately? I'm eager to experiment with this vegetable over the coming months. 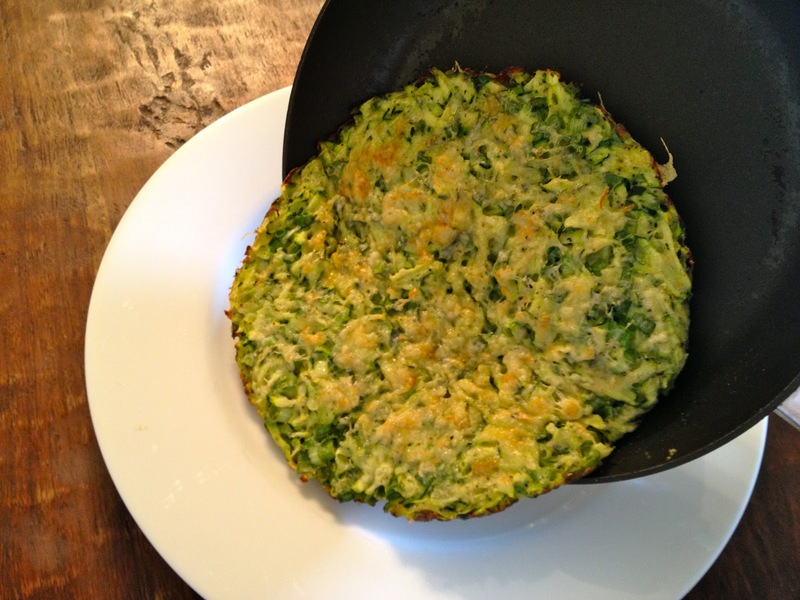 Currently one of my favorite recipes using zucchini is my "Zucchini Frittata" recipe. As much as I love that recipe, I would like more "go-to" zucchini recipes. 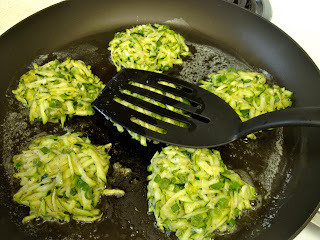 After a week of zucchini pancakes for breakfast everyday and twice with dinner, my husband is happy that I'm done tweaking my new recipe for "Grated Zucchini Pancakes." The best part? 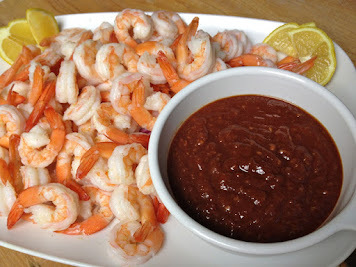 If you use the appropriate ingredients this recipe qualifies as a Phase 2 South Beach recipe. 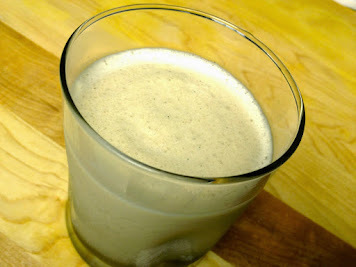 I love "Potato Pancakes" and this makes a great "lower" carb substitution. You can make a personal pancake in an 8-inch frying pan (my favorite and what is pictured below), a giant pancake that you can cut in pizza-like slices, and small cakes like small pancakes. What's your favorite? 1. Grate zucchini with a large box grater or similar device into a large mixing bowl. 2. 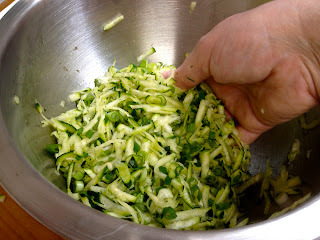 Finely slice white and green parts of scallions and add to the zucchini. (Optional - reserve some green ends for garnish). 3. 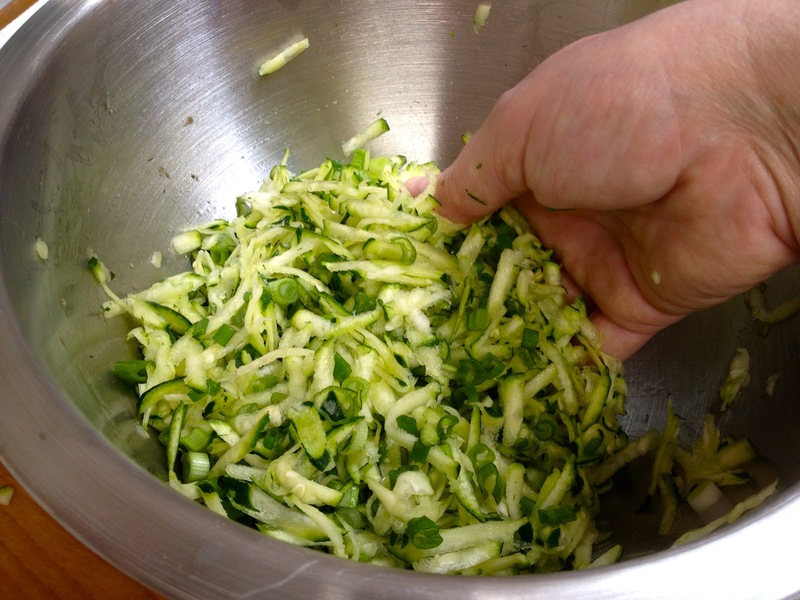 Mix the zucchini and the onions together by hand. 4. Using paper towels squeeze dry the zucchini mixture. 5. Mix pepper and flour into the zucchini mixture. 6. Lightly beat 1 egg in a small bowl. 7. Add the lightly beaten egg to the zucchini mixture and stir with a fork. 8. 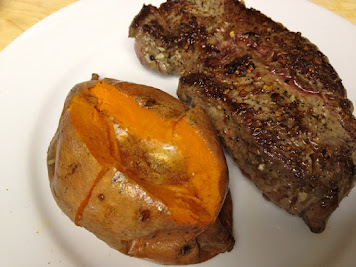 Heat butter in an 8-inch oven-safe non-stick frying pan over medium heat. I love ScanPans for this type of cooking. Also, pre-heat the oven on the low-broil setting. 9. 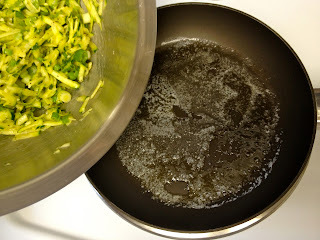 Spoon the zucchini mixture into the pan and press flat. Press around the entire edge to form an even pancake and cook for 5 to 7 minutes until the bottom is golden brown. 10. As the pancake is cooking in the pan (in step 9) salt generously and grate parmesan cheese evenly over the top of the pancake using a microplane. 11. 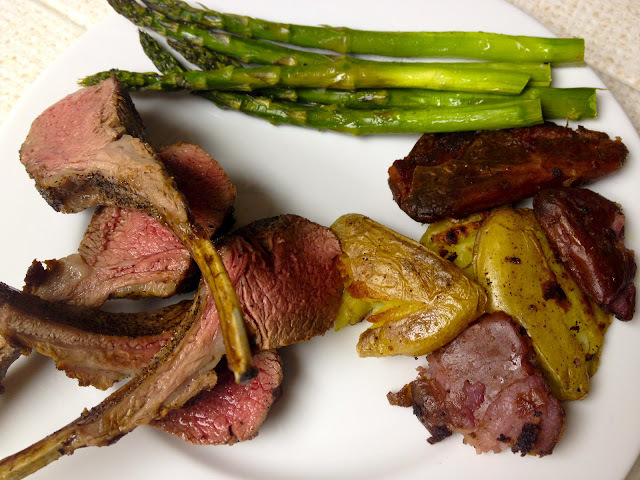 When the bottom is golden move the oven-safe frying pan to the second-to-the-top shelf under the broiler. Broil 8 to 12 minutes or longer depending on how golden brown you want the top. 12. Serve immediately with sour cream, yogurt, or creme fraiche. You can also add fresh herbs. Double the basic recipe listed above for a 10-inch oven-safe non-stick frying pan or triple the recipe for a 12-inch oven-safe non-stick frying pan. This version needs to broil on low (second to the top rack) for a little longer than the 8-inch pancake. Serve in wedges. 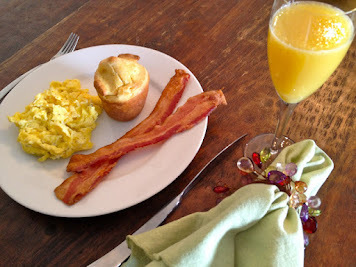 Note: these go great with "Greek Smyrna Meatballs" from Whipped the Blog. The recipe for the 8-inch pancake listed above will make 8 small pancakes. Depending on how many you want you may want to double the recipe. 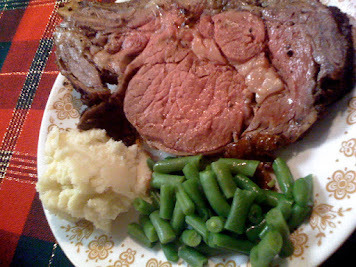 After the bottom is golden brown you could just flip these over and cook the same way on the other side. However, I decided to keep the same basic method. I placed the pancakes on a parchment lined cookie sheet, grated the cheese over the tops and placed under the broiler. Totally excited to make those, even though I am the only one in my family that will eat them. I am getting a bunch of zucchini in my CSA order next week. Thanks for sharing it! Me too! Chuck eats them reluctantly but that's why my favorite is the 8-inch personal pancake. I can make it just for me! I love these. Had them fried like a potato pancake. Can hardly wait to try them fritata style. m.